As You will not be able to post to this thread because it is in the guides section. There are 2 male and 2 female characters to choose from. The 2nd female is on the top deck to the top right. You do not see her face unless you click on her (at least on my screen) she is cut off by the game window. then click the arrow buttons on the (right) face change interface. Hair and face will change with those arrows. The hair change arrows do not work. First a map appears over the scene and the "story of VC" scrolls. Click Esc to make the map disappear. Caribbean Pirate = Equally strong in both areas, but not as strong in land as IG or in sea as RMO. click "yes" to clear the confirmation screen. You will automatically "learn" all 4 weapon skills at this point. Finding an master for your apprenticeship is difficult until you know a few people in game; also if you do this quest line you will exceed the requirements for apprentice awards. You have to level evenly in land and sea strength to get rewards which is nearly impossible the way the game is set up - unless you enjoy grinding and not doing quests.. all for rewards that are not that great anyway. Please read the next few post so you have some general information about the game. The following information is for new player and I have found that a lot of older players no longer remember to tell new players this information. 2 suggested ways of leveling / promoting skills for a new character created September 2013 or later. You will have to buy the Ship building skill First, from the Skill tutor (inside Athens city near city gate). Then, in order to "learn" the skill to 100 (you click to learn the item you got at the Ability Book Exchange master; it looks like a birthday present). Battleship - Holds the most cannon and is middle in speed of the 3 types of ships. Trader- Slow but holds large load. If you do not do this step right away before starting play of the game, you may have to remove provisions, cannon, or ammunition and put them in your warehouse or bank because of the excess load. 4) Go to the Athens Docker select Dock then the ship you want to use. - I suggest the adventure ship because it is the fastest of the ships, however if you want to concentrate on sea battles then the battleship may be your choice. Trader ships are rarely used anymore because they are slow and an adventure ship can hold more load by "refining" the ships figurehead. When you try to sail off you will probably need more sailors, the docker will automatically sell you the minimum amount needed to sail when you try to sail off. Pay attention to the number of sailors the docker wants to sell you... then go to the tavern and buy your sailors for 1/2 the price. *** I suggest learning Ship building w/ the reward gold, so you can repair your own ship for free.. It is free to repair level 1 ships at the ship yard boss, but any other level costs coin. To repair your ship: (click the repair icon ctrl+a >> interaction tab >>icon looks like a hammer in front of a piece of wood)...then click the picture of your ship in the ship attributes window (ctrl +z). 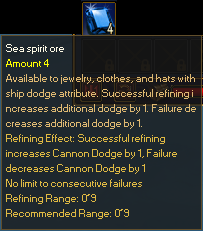 You can only repair your ship when stopped at sea or while on land. I suggest you drag that icon to your "hot key bar" at the bottom of the screen so you can use it more easily. You will get a "sea mermaid" in the 30 minute timed pack. As soon as you get this equip it to one of your ship equipment slots. It will keep you from sailing into storms at sea which wastes precious time, sailor healing kits and ship repair kits. And, it will keep NPC Pirates from attacking and hurting or killing you, your sailors and ship. You can buy more sea mermaids in the INGAME mall (Ctrl +B) for 12,000,000 game silver or buy them in the Online Mall for 29 IM Points (approx $1.60 USD). Buying only shipbuilding leaves 3 reward gold for other skills. 1) BUY the Voyage pack (unless for sure you only want to use a battleship, then buy sea battle). Because you level so fast now, when you get the Free level 11 ship you will not have voyage level 60 and will not be able to sail it. ...And, If you plan on joining a guild soon; you will want voyage at level 100. This way As soon as you finish the Knights vigil quest lines and get the free lvl 11 ship, you can buy the level 13 upgrade pack and you will have level 100 in voyage and be able to sail the lvl 13 upgraded ship immediately. (See below for more info). Do not join a guild until after at least #68... we have reports if you are in a guild your quest line can break. Alchemy and Medicine have stunts that will help you heal faster and get a higher healing value from potions. I find Sea battle levels slowly and having the ability to use higher level cannon to finish the Knights vigil is almost a necessity. For Healing and Alchemy immediately go to the skill tutor and buy the healing stunts "Effectiveness enhancement" (Alchemy) and "Healing" (Medicine) up to level 10 as you money allows. For Sea Battle invest in the cannon stunt each level stunt is one level of cannon so go to 5 or 8 as money allows. And get grapple to 5 or so because later you will need to grapple more ships. You can also buy more ability reward gold in the Item mall (http://vc.igg.com/mall/mall.php ). All skills can be trained to 120 for free (as of 3/23/14) ... but they do not start collecting experience levels until the skill itself is learned from the skill tutor. You no longer need to promote a skill to phase 2 or phase 3 at the skill tutor to continue earning skill points. **WARNING** you get a total of 5 of these points to spend even though there are 15 things to spend them on! Do not use them until you know for sure which skills you want to have!! Use/click the super honor certificate so you have reputation.... and then buy noble rank, and the amity for the rank, when ever you can afford it. You have to have noble rank to wear some of the uniforms and use some of the weapons in game and to equip the "belief item you get free from timed prizes or pick up in drifters. ** you may not need reputation or noble rank to wear the profession uniforms or use the profession weapons 120 and below..By the time I was in 120 gear I was already a Baron... but never had any trouble equipping profession gear from the quests. Buy rank from "King Aiolia in Athens city, buy Amity from "Official" in Athens City. You will need the rank of Baron to be able to talk in the "common chat channel" which is the 2nd screen of Public chat and the most used chat screen. After you finish the Beginner Quest Line, (or at least get to 120 then 140) you will then NEED do the 2 Knights vigil Quest lines (given by Kratos in Athens) at the end of the 1st Kights Vigil Quest you will get a free level 11 Adventure Ship. JOIN A GUILD and work on getting personal vigor (by doing daily quests from Athens dock and Sanctum of memories, and from inside the guild hall) . This pack must be used in Genoa. You will need level 100 in voyage to sail the lvl 13 Adventure Ship. It is not recommended to upgrade or even use trade ships... figurehead refining, charms and ship auxiliaries can add so much load capacity, the little extra load capacity when using a trade ship is not important.. also max trader level is 13. Battleships and Adventure ships upgrade to 15. Making cash/ silver coin in game is tough for beginning players... save every silver you can! When you get to #26(B) Grace of the Battleship - Do the instance, you only need to kill the first 3 ships and it gives 1,000,000 coin! (you can quit/ leave the instance by leaving team). sell the dolphin and shark charm (they do not add any stats and you should be using the certificates of overlord and sea mermaid in those ship slots). Sell extra drops you pick up; if you needed only 5 antlers but had 7, sell the extra 2 after your turn in the task. Authenticate/ identify (@ Identifiers... "Pascal in Athens city, other names in other cities) any drops you get the first time (a screen pops up if it is an item that can be "authed" ). You get money and reputation when you authenticate stuff. Some items can now be authenticated over and over but you only get 1/2 the reputation amount for the 2nd , 3rd, 4th etc.. time. Stay a few extra minutes when your are killing or collecting, and collect more drops.. since your spaces are already taken up by 2 or 3 of each why not make it 20 of each, and sell the excess. To sell an item to an NPC you must go to a NPC that sells items....ie. Blacksmith, Alchemist, Tailor, Pet Merchant, Shipyard Boss, Docker (provision screen). 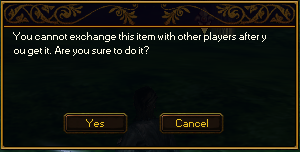 Just click the trade option then drag the item you want to sell over an empty or filled slot in the npc window. You can also set up a booth or trade "in person" with another player.. However most (if not all) of the items in this quest are considered low level and will not be needed by established players. (dont bother trying to sell items to players until you are well above lvl 130+ and can ask others what they need). Do not make a 2nd character on the same account as your main character. Just get a new email account somewhere and start a new VCO account. And probably do not make a 3rd, 4th or 5th etc.., on the same account either. Why? - for trading purposes. If you have different characters on different accounts then you do not need a middleman to hold items (and possibly steal them) while you log in and out characters. I have had as many as 8 characters logged in at the same time... (that's all the accounts I have) though lag does begin to happen at that point. one character as your main (fighter), one character for mining, one for logging, one for fishing, one for planting, and possibly one for healing your fighter, or one maybe even one for sewing or shipbuilding or alchemy. My first main was actually a healer but later I created a tank/fighter so I could level by myself. Starting about the 150 level, game play with others (not alts) starts to become necessary. Be sure to physically write down your account name(s) and corresponding password(s) AND email(s). Then stash them somewhere like your sock drawer where little brother will not find them. IGG will not compensate items lost by hacking or evil little brothers who think they are playing the game but are actually dropping your items on the ground so they are destroyed. Note; ** No Land Star Uniform or Fire Neptune Figurehead anymore. No free sea mermaid (to avoid storms). no free stuff in warehouse anymore. *** At this point I did not open the last reward package I did not end up needing it to complete the beginner quest line. so I wanted to save the ones in the pack for later... only way to do that, is to not open the pack. Because the timer begins when you open the pack. You will also be given a belief (character equipment) item called "Confidence" and "Tide"
you need to be profession level 50 AND have noble title/rank level 5 (Baron) to use them. I reached profession level 50 at number 35 (in this guide). Buy your rank/ noble title before you reach #35 while you are in Athens (perhaps while doing #21 if you have the coin)...at King Aiola in Athens. (if you have not changed nationality) you should have enough Amity with Athens to get level 5 (but not level 6). If you need to you can buy Amity from Municipal minister. You will need level 6 noble title to speak in the public chat channel. beware that many times it will try to run you a straight course through a wall, or you may get stuck on a rock. So you may have to manually click to get places from time to time. * You must finish through #3 and up to possibly #7 before you are able to sail. You need level 10 profession to sail. **If you accidentally destroy or lose an item such as the heirloom weapon, war drummer, or eastern chart you will have to go to IGG support, and have a tec add one to your account. 1) All Uniform, Helmet, Weapon and Jewelery rewards are "bound upon pick up" ie they become bound when you equip them. 2) All shortbread potion rewards are bound. Follow the steps for #71 very carefully or the quest line WILL break!! Not really part of the quest line as every character HAS TO do this. I did not look to see if Voyage, Seabattle, Elo and BH were awarded at this time,,, but I had them a few quests later. I do not suggest trying to get a "master" until you meet/know/ talk to people in the game. And suggest you forget about this quest anyway. The apprentice system doesn't really match up with the beginner quest line and you will not get the apprentice rewards unless you stay under certain levels while making certain other levels. If you do the beginner quest line you will not meet the requirements for the rewards and will mess up the future rewards requirements as well. Most people do not use the apprentice system. Click on Langer in Athens Dock (he should have a blue question mark over his head and says "click me to accept the first task"
the interface says to choose your profession... click "all right"
The pop up box does not close which is confusing.... click the x and close the box then re-click Langer. Click the yelow underlined word "Langer"
You can also open the Voyage Log ... click the book icon at the 2:00 position in the ships wheel bottom right of screen or Ctrl+F. And then click the underlined words there to autotrack. You do not have to choose the weapon indicated for your profession. But each profession has more stunts and buffs for the indicated weapon. click : "query the task"
**Only buy Provisions** the word "provisions" at the docker, will be green for this task. Reward (Voyage Log): Prof Exp 6,400, Silver 20,000, Sea Mermaid. Note: At this point you should be able to sail. the next few quests give eloquence and level your ship even though you are not actually sailing. At this point; after switching ships, Equip your Navigation star figurehead and Sea Mermaid (you get one in the 30 minute reward package), and maybe 2 of the certificates of overlord then continue to next quest. to switch ships; go to the docker and click "dock"
then go to the docker and choose > "dock" > click on ship you want to use > then click"take out ship"
The Colossal Korean Turtle ship is the "raider" type ship and is the fastest. The Battle ship is slower but will hold more cannon and is best for sea fighting. The Zheng He Treasure ship is the slowest but holds the most load (weight). **** YOU NO LONGER NEED 91 voyage (sailing) and 91 Eloquence or Sea battle (sea fight) skills to sail the free level 10 ships!!!! you can buy sailors and heal sailors at the Tavern for 1/2 the price that the Docker charges. Suggestion 2; go to the skill tutor (inside Athens city gate) and buy the skill "ship building" then go to ability Book Exchange Master Athens dock: 50, -48 and exchange 1 of your ability reward gold for ship building package. after you "learn" ship building, you can repair your own ship (at a decent pace) and won't need to pay the docker for repairs. Right click the package and your ship building skill will automatically go to 100. **note the icon for ship building skill at the skill tutor is rather dark. It is on the first tab "skill" and on the bottom row under "Producing skill".... it is the 3rd from the left. It will become highlighted w/ yellow halo once you click it to select it then click the bottom button "Learn". Click the figurehead drawing you get from the skill tutor, to learn it and get it out of your inventory.... the "ship building skill" will now be colored in the skill tutor window... now go exchange the ability reward gold... the package you want is near the bottom of the exchange list... right side, 2nd from bottom. Suggestion 3; You will get a "sea mermaid" in the 30 minute timed pack. As soon as you get this equip it to one of your ship equipment slots. It will keep you from sailing into storms at sea which wastes precious time, sailor healing kits and ship repair kits. And, it will keep NPC Pirates from attacking you. watch the white words in chat and green words on screen it will tell you that the ship is being repaired. If you move before the ship is finished repairing, the game will ask you if you want to stop repair. The higher your ship building skill level the faster you will be able to repair your ship. the next few quests give eloquence and will level up the ship's individual stats even though you are not actually sailing. Click the green underlined words in the voyage log to auto track to the next npc's. Report to the Merchant Guild Master. Merchant Guild Master tells you to buy 5 Boxes of Seafood from the Trader in Athens and then report back to him. click the underlined word "trader" to auto track. buy the seafood and then click the underlined "merchant guild master" to auto track back. You will get 300 reputation and 20,000 coin if you click it. It will announce the city's popular goods in the Popular item (trade) chat channel. Go to the Skill Tutor and increase The Eloquence STUNT of Purchasing skill to lvl 2, then talk to Merchant Guild Master** (Different NPC than old quest). The tabs and buttons you need to click to do this now flash... pay attention you will need to do this for all skills on your own as you level. again this quest auto started for me when auto tracking. Sail to Istanbul and buy 1 box of olives from the Trader then bring them back to the Athens Merchant Guild Master. If you have not already done so: At this point; Equip your Navigation star figurehead and Sea Mermaid, and maybe 2 of the certificates of overlord then continue to next quest. ** If you did not buy sailors above, when you talk to the docker, and confirm you want to go to high sea you will auto recruit 12 sailors for the minimum amount needed to sail a caroelle ship. ** to sail the turtle ship... you need an additional 178 sailors (you already have 30). HOWEVER, You can buy/hire sailors at 1/2 the price if you talk to the tavern boss at the tavern in the city... though the tavern boss interface was a bit messed up for me, it said I needed zero sailors for 178 coin. (It actually cost 8,900 coin so I have a total of 208 sailors on my Turtle ship) ie. cost was 50 coin per sailor instead of 100 per sailor at the docker. If you use auto-track you do not even have to click anything but the docker anymore... you run from Athens Merchant Alliance to docker, auto sail to Istanbul and auto run to trader and after clicking the istambul trader did not have to click anything to submit my quest. You should already have 200 cannon balls so buy 1,300 so you have a total of 1,500. You will need to equip navigation star figurehead if you are using a level 1 Caraolle ship. the Caraolle Ship won't hold the weight of the cannons with out it. DO NOT equip the ship armor and cannon!! They will not be detected if they are equipped. If you un-equip them, go into the city and back out and wait a literal 2 minutes for the items to re-show in the Voyage Log book. Due to lag or some other problem the items were in my ship equipment slots but not detected after purchase. Try going into the city and back out or re-logging into the game. so OPEN YOUR VOYAGE LOG (CRTL+F) to continue the quest line!!! you can get ship armor, cannons, ship ammunition, ship repair kits, and sailor medic kits. If you are using any ship above level 1 (lvl 1 is free repair at shipbuilder) repair it for free; buy shipbuilding skill at skill tutor inside city then buy shipbuilding ability gift pak for one of your ability reward gold (@ Ability Book exchange Master; Athens dock bottom of ramp) and use the pak. Then click the repair icon (command (crtl+a) > interaction > repair) then click your ship's picture in the "sail" interface then click "yes". Equip your weapon, Go to the suburbs and kill Bellweather and collect 1 sheep horn DO NOT Authenticate the "sheep horn" then return to Veteran. Shipyard Boss, Tailor, Blacksmith or Alchemist will buy items. Just click and drag an item into the NPC interface (where the items for sale are shown). be sure to click both check boxes of Active Attack and Auto attack then click "yes"
make sure auto loot is activated... on "pick up" tab of the same interface, check the box at bottom. "activate auto loot ability". kill reindeer and bellweather and pick up plants (hold alt key to see them) authenticate at "identifier" (in next quest) all that you can then sell the left overs. Auto track stops working when you enter the city, use regular autotrack Alt+X (Identifiers is the NPC name in the autopath interface type a capital I to see it or scroll to it..) or the overhead map Ctrl+M. you may not run directly to the Identifier, he walks around. Look for the white question mark over his head. You get 597 silver coin and 35 reputation for sheep horn and or pilrose antler authentication/Identification. ***Equip you badge and new weapon!! Speak to Wendora in Athens Tavern. Quest says Lemnos island but voyage log gives either as options and, Thasos has the wolves and Jasmine for next quest... why sail 2x? **HInt; when you come across drifters or wreckage drifters in the ocean click and go in. You can pick up Captains logs, coin, sailor healing kits, ship repair kits, figureheads, cannon, belief items, compressed provisions and more.......Sell the figureheads and cannon you do not want back to a npc and make come cash!! 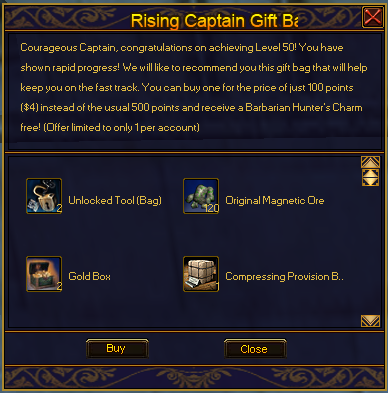 There are also belief items and captains logs in the drifters, however they can not be used for Exploration log points until you reach profession level 120??? **authenticate any wolf teeth you get and sell the rest. Go to Lemnos Island and collect Graceful Jasmine Herb and bring it to the Veteran. Go to Skill Tutor and learn the Sea battle STUNT Grappling. Then go to the Shipyard Boss and buy a Grappling Hook then report back to the Veteran. make sure you characters hp and sp levels are full; use the first aid kits and recovery potion. then Go to Crete Battlefield, Board the Iron hand ship (by grappling) and kill the Captain of a Crete Iron Hand Ship (written in log book as Crete Iron Fist Armed Ship). Report back to the Veteran. 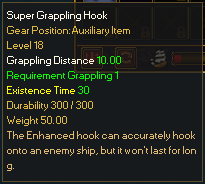 [ Use the grappling skill by clicking the ship you want to board, and getting as close to it as possible(run into it if necessary) then click the grapple icon. Suggest you move the icon to your sailing "hot bar" so you can use it easily while in the battlefield] .... the fighting scene will change to 2 ship decks.....Look for and kill the captain of the pirate ship, they are usually near the ships wheel or climbing over toward you on the ropes ignore the regular sailors. Go to the Alchemist and buy 5 bottles of low level healing potion and 5 bottles of low level recovery potion, then talk to the Ares Warrior Alliance Master. ***Check your inventory, you may not need to BUY the potions you may have picked up enough as drops from killing monsters/animals. Defeat the Depressed Poet in the Athens Subs then report back to the Master of the Ares Warrior Alliance. If someone is camping the poet, use a gun so you don't have to run to kill him, though poet spawns immediately and 3 are present at all times in back of the temple ruins. killing of poet will go faster if you use an attack shortbread. Reward (Voyage Log): Prof Exp 130,000, Bare hand exp 10,000, 4 weapons exp 50,000, 50,000 coin, Bronze Ring (ordinary) lvl 13 Land Jewelery , Glory Certificate. Reward (chat, Actual reward): Prof Exp 1,500,000, Bare hand exp 10,000, 4 weapons exp 50,000, 50,000 Coin Silver Ring (ordinary) lvl 23 Land Jewelery , Glory Certificate. Talk to King Aiolia in Athens. ***Hint; Sell back your now "old" low level jewelry to a NPC and make some cash and use that glory certificate! Sail to Alexander and buy 5 buckets of Mutton and 10 baskets of wheat. Then sail to Tripoli and buy 5 baskets of beef. Then return them to King Aiolia in Athens. Find the Bank Clerk and deposit at least 1 silver coin. Then return to Verne. Deposit >> Deposit tab >> type amount to deposit on the "cash in" line. >> click "yes"
(Create NPC Password - The option to create a password has never worked, nor is it expected to be "fixed" . Note: The Voyager Times is a book that goes into your Item slot, right click it and find many well rewarding and repeatable tasks. I suggest you activate all quests that you can. Check it every so often as more quests are released at different profession levels. You often finish or partially finish quests just doing other tasks. Talk to the Athens Ares Warrior Alliance. Go to Crete Offshore to kill 1 Wandering Soul and report back to Ares Warrior Alliance. Note: Wandering Souls are hard to kill, you will like having the Certificate of Overlord, (Temp) & Commander in Chief Certificate, (Temp). Reward (Voyage Log): Prof Exp 1,100,000, Sea Battle Exp 200,000, 4 weapons exp 70,000, 5-Glory Certificates. Reward (chat): Prof Exp 2,000,000, 4 weapons exp 70,000, 5-Glory Certificates. Talk to King Aiolia and promote your (noble) rank to lvl 2 (Hero; needs 800 reputation, you will have to buy rank 2x) then talk to Aiolia again. First "Apply for noble title" 2 times... then when the blue question mark appears over his head; "Query the task"
Note: Starting the game your citizenship will be Greek. If you wish to change your citizenship to a different nationality you will need to speak with the Ruler in the particular city you wish your nationality to be. You DO NOT have to do this one to continue in the quest line. However it gives 1,000,000 silver coin so do it anyway so you can raise your rank to level 6 (Baron) and be able to talk in public chat. **You only need to kill the ships in the first 1/4 of the instance (first skull area on overhead map). Exit from your team for a fast way out of the instance. Reward (Voyage Log): Prof Exp 30,000, 20,000 Coin. Reward (chat): Prof Exp 500,000, Silver 1,000,000. You can now make a team with (an invisible) NPC. You do not have to team with an actual player. ctrl+x >> "Make Team" tab >> click the top most of the 4 buttons at the bottom right of the interface marked "Recruit..."
you will automatically be assigned a random NPC as a team mate. Talk to the Merchant Alliance Messenger. This is an area of contention that I have. To continue this quest, you need to choose a Merchant Alliance. For veteran players, this is an easy choice, but for any new player confusion will rule. If you select a particular Alliance, then, later on decide to become a member of a Guild, you may not be able to join that Guild, do to the Merchant Alliance that Guild is in. It is Possible to change Merchant Alliances, but the change may require the use of Special Offer Vouchers. They are available, to a point, but usually they cost real money. Just keep in mind, if you are new to the game, this choice will affect your choosing of Guild membership. Talk to the Merchant Alliance Messenger; Join one of the Five Merchant Alliances, then talk to the Docker. 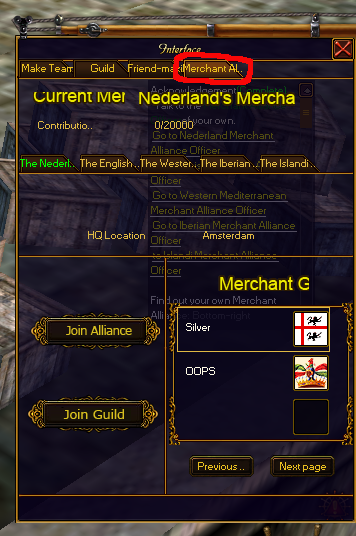 Merchant alliance messenger does not give anything I got a message in white chat: "you have been affiliated with, consuming silver"
next you go to Crete for a flag. 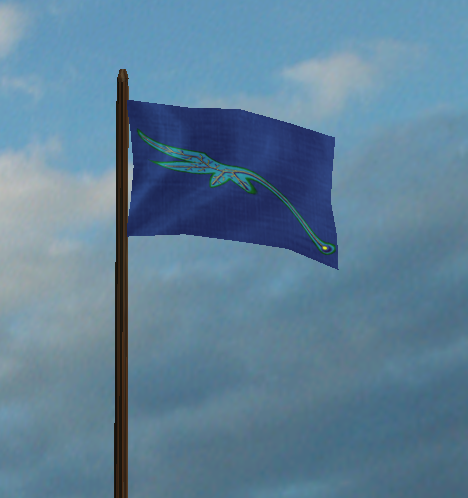 click "Merchant alliance affiliate of free player"
highlight the guild you want to join and click the button at the bottom left "Recruitment Application"
This is what the guild flag in all the MA cities looks like. 1. You have to wait at least 3 days (real life) after joining or changing Merchant Alliance before you can change to another one. 2. Talk to the NPC "[Name of the Merchant Alliance] Principal" at the capital city of the Merchant Alliance you want to change to. 3. (a) Choose "Merchant Alliance Affiliate of Free Player"
(c) Choose "Merchant Alliance Affiliate of Guild" if you are Leader of a Guild and want to change the Guild's Alliance. (All Fleets that belong to the Guild will automatically change to that Alliance, and consequently all Guild members will automatically change to that Alliance). (d) if you are a regular member of a guild you will have to quit the guild before you can change Merchant Alliances. Get back the flag from pirates at Crete "dock" (kill pirates on grassy area above Crete Docker). Then talk to the Crete Docker. Note: You will need to venture to the island and kill a few pirates in the area until they drop a flag. Make sure you have a free slot in your inventory when killing the pirates (item tab?) or you will not receive the flag. When you sail off the quest "account safety verification" may open... open your log book click and highlight "punish the pirates" so you can see your quests again. For Crete type in the Capital letter "C" and find "Crete Offshore"
before you enter Crete Off shore so you can get to Crete Island.... turn off your ships auto fire! When you enter the battle area wait about 3-5 seconds. Yes, you may get hit, but do not fire back or the option at top left to go to the dock will not work. Make sure passive attack is on (alt +x >> killing monsters tab >> check "passive attack"
I suggest you just open the big overhead map (ctrl +M) when on Crete beach and click the middle of the grassy area to the right of the path/road. Your character will run where you clicked. Check your voyage log or check your character inventory to see if you got the flag. I got it right away and didn't realize it as was mobbed by 4 at once. Talk to the Seville Docker. You need to enter the city then go back to the docker to complete the quest. Since our last update March 28?, the quest line has broken 2 different times at this point. Today as I write it is working again... so keep your fingers crossed. *** June, 7, 2017 0.124 (Defence of Yizhou) Patch it broke here again. SO IF IT IS BROKEN... WAIT A FEW DAYS THEY FIX IT EVENTUALLY!! Go to Mallorca Island Inland and defeat 1 Frenzied Bear. Then talk to the Official (Officer) in Seville. **Auto track green words did not work to go to Mallorca, they did work going to Seville. Select Female or Male Future Fighter Charm (from official). Prof Exp 7,000,000, 4 weapons exp 100,000 Silver 100,000 and future fighter charm. collect all 4 types of bear claws and one coffee plant for authentication/identification since you will be going to the npc near the identifier in Seville. **Note when you turn in this quest a special 1 hour high wind spell is started.... so start sailing to Stockholm right away. Talk to the Trader in Stockholm. Note:By now you should have a great feel for the game, and since you know you are sailing to another city to visit the Trader there, why not fill your ship with goods and make a few silvers and get some Eloquence while you are at it. Talk to Tross in the outskirts. (Stockholm Suburbs) - He walks around a lot so you ma not auto track right to him. Defeat Pirates (Stockholm Suburbs) and collect 5 of "The Boss's Goods" (shows in Articles tab) that belong to the trader then talk to the trader. Boss' Heirloom (Weapon of your choice)----NOT LISTED IN THE REWARDS ON QUEST!!!! **NEW** Reward (chat): Prof Exp 10,000,000, 4 weapons exp 100,000, & got a message about "guild vigor" not being received because I was not in a guild. Note: Pirates are in the Stockholm Subs, just beyond Tross. Do not EVER throw away your Heirloom weapon!!! You will keep it a long time, but you need it to finish this quest line!! You will need it on your character to complete #149! *** Bosses Goods do NOT stack, but you now only need 1 so make sure you have 1 slot in your item tab. ** NOTE The reward titles and descriptions do not always match!!!! Go to Stockholm and talk to Stan. Reward (chat): Prof Exp 10,000,000, 99 -Abandoned Steel, 99 - Abandoned Rough Handle, 99 - Abandoned white Rock and Sea battle increased. Use the items NOW to refine the Heirloom weapon, then start next quest. 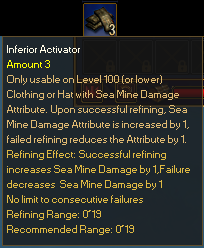 Put Heirloom weapon in equipment tab slot, then it is easiest if you put the refining items in the hot bar so you can use an "F" key to activate them Click the F key then the weapon until the maximums are reached. Discard any left over refining items, they can only be used on Heirloom weapons and are bound so can not be sold. Some items will not be easy to throw away. Most items you can just take from your bag or ship click and drag and drop them to the ground to throw them away. at the point I have found 2 items so far I could not drop. shows up at top right of screen just click "yes"
just TYPE the letters "del" in the space and click "yes" and the item will disappear. Talk to Stan again after you refine your weapon, pay close attention to how many of the refines fail, remember this when you visit the VCO Item Mall. What you just experienced is considered a REALLY GOOD success rate. Reward (Voyage Log): Prof Exp 1,000,000, 3 - Dodge Shortbread, 3- Life Shortbread. Reward (chat): Prof Exp 10,000,000, 3 - Dodge Shortbread, 3- Life Shortbread. Defeat vikings (Stockholm Suburbs) to get 1 of Stan's lost gems and return it to Stan. Vikings are a bit hard to kill, they tend to mob you, Suggest you use some of your free shortbread potions. If a shooter gets you, run toward the city to a spot with no vikings so that no other vikings join in the attack on you. Reward (chat): Prof Exp 10,000,000, 4 weapons exp 100,000 and Helmet of your choice. Helmet you get is level 55!! Use the stones on the Heirloom weapon. Go to Lisbon and talk to the Docker. Reward (chat): Prof Exp 15,000,000, 4 weapons exp 100,000, You will get an item called "Mila's Parcel" in your Item tab area of your character's storage. Bring the package to Mia in the Lisbon Tavern. You Get level 55 Uniform!! Go to Lisbon Suburbs and defeat 20 Tomb Raider Swordsman and bring the ring back to Mila. Voyage log conflicts itself text says 20 and counter is only for 5 kills. 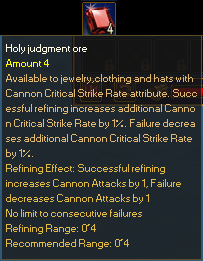 Cursed Ring goes into Items tab on characters inventory. Turn off auto pick up in case you kill a tomb leader, you DO NOT want the key to the pyramid. ***Some time around this point at level 60 the Knights Vigil quest line will show in your voyage log. YOU CAN NOT BEGIN THE KNIGHTS VIGIL QUEST LINE UNTIL YOU ARE PROFESSION LEVEL 120!! again re- open beginner quest line... IDK why they like to confuse beginners by opening new quest lines showing the new quests instead of the one they are suppose to be doing. Take gold, (given to you), and talk to the Docker in Genoa. Talk to the Merchant Alliance Officer (MA) of your alliance. Auto track took me to my alliance.... they may have fixed this to work for all alliances now!!! Talk to Alk in Athens City (77, -34). Or, now may be the time to change nationalities and get that countries noble titles if you should wish to do so. Go to Sicily adventure island and kill 5 Poisonous Stinging Bees. Then return to Alk. Auto track to Sicily and the bees is not working.until you land on Sicily beach. Auto track back to Alk does not work until you are on the high sea. *Slight warning* this is probably the first suburb you will go to where the "monsters" will auto attack you, but a group of 6-8 monsters was no problem for my lvl 66 character wearing all the free stuff I had gotten so far. ***Hint; Authenticate the drops you got from Sicily monsters, check the beach for shells to authenticate, and sell back any extra shells, or extra monster drops (weapons, leather, bee sting, tusks) for more coin and reputation. You will also be given a belief item called "Confidence" from the 10 hour timed rewards. you need to be level 50 AND have noble rank level 5 (Baron) to use it. Buy your rank at King Aiola in Athens (if you have not changed nationality) you should have enough Amity with Athens to get level 5 (but not level 6). If you need to you can buy Amity from Municipal minister. Talk to Andrews in Genoa. Talk to Sandy on Mallorca Beach.Auto track does not work until you land on Mallorca Beach. Voyage Log auto track will not work from Genoa, use regular auto track. **Text says: Go to Mallorca Subs and kill 3 Grizzly Bears, 3 Black Bears, 3 Brown Bears. Then Report back to Sandy. Go to Mallorca Subs and kill 3 Cannibal Warriors, 3 Cannibal Champions and 3 Cannibal Javlineers. Then Report back to Sandy. ****The quest text says kill bears but the Quest Progress says kill Warriors..
if you luck out and shells appear while you are on the Mallorca beach, grab a queen tegula or the others if you still need them, on the far east end (beyond the instance entrance) for authentication. Suggestion; do the Voyagers times Reputation task for a frenzied bear while you are here. **At this point I had about 1,000,000 + silver coin... I used some to increase my skill stunts while in Alexandria. but like the other time... it does not work! Kill Tomb Raider Leaders to get the key to the Pyramid then TALK TO Muhhamed Husni (to the FAR right of the entrance - he may be offscreen) click through his screens ( you get the "reward" from him) then enter the pyramid. As of August 22 2012 the key to the pyramid CAN be dropped if you get too many. It is not clear in the in game chat or log book, what you are suppose to do after you get the Pyramid key (book). If you enter the Pyramid, nothing happens and your quest will NOT advance. This task auto starts when you "finish talking" to Muhammed in the above task. so watch you log book or the Quest tracker screen. Look at the big map ctrl +M , turn of passive and active attack, and run to the door marked "to pyramid top level". There will be enough monsters in there to get your 5 of each so ignore the ones on the way (unless you want to level up a bit). the next flat area is where Anubis is. kill him then go get your 5 of each. Kill 5 Bewitched Mummies, 5 Dry Mummies, 5 Giant Armed Mummies and 1 Anubis. Report back to Husseinin Alexandria City. Note: Anubis used to be camped, if this is the case when you arrive, just request to team with whomever is there, the entire team will receive credit for the kill. Suggestion; Use explorer card to get back to town. Can be bought for 50,000 game silver under item tab in the in game item mall. If you are like me and want to collect all the authentication items before you leave, there are actually 4 kinds of mummy and Anubis. Stinky Mummy only spawns in the "room to the top level" and it is a rare spawn and even harder drop. Maybe like 1 in 15 drops the bandage? Level 75 Helmet is given. Talk to Ellery in Alexandria City. Quest tracker not working for this one use voyage log. Talk to Gisippus in Venice. **Remember to stop and go into drifters when on the high seas you may get compressed provisions... they are always needed. **Remember to go to the trader and promulgate for 300 reputation and 20,000 coin when ever you go to a city. and get back to the beginner quest line. Treasure Hunter quests will take a lot of map pieces and silver coin so save them till you progress much further in the game. Talk to the Explorer in the Sicily caves. Auto track does not work until you land on Sicily beach. When in Sicily inland, you will still get stuck near the cave entrance, so take a couple of steps to the right, and click the green underline word "Explorer" again. Suggestion; do the Voyagers Times quest Skill Task for Sicily Frogs while you are there. Talk to Kuhne in Amsterdam port. Kunhe walks around in a rather large area, use auto track then look for him. **Clicking the green name of Khune does not auto track you to him even when on the high seas or in Amsterdam, so use the regular auto track feature on Sicily and to sail to Amsterdam. Talk to Cyrus in Bordeaux. **Clicking the green name of Cyrus does not auto track you to him even when on the high seas or in Bordeaux, so use the regular auto track feature. Cyrus walks around in the big stone area across from weapon smith and Kastel. 64. Cyrus, a nice Person. Talk to Lima in Lisbon City. **Clicking the green name of Lima does not auto track you to him even when on the high seas or in Lisbon, so use the regular auto track feature. Talk to Andrews in Genoa City**You Have to use the voyage log to auto track for this task. Talk to the Merchant Alliance officer of your alliance. Talk to the Seville Tavern Boss. ***While you are on the top level in Seville, visit the Fee Gear Giver (18, 27) and get as many rewards as you can. You get rewards for reaching lvl 30, 60, 90, 120. You get 1 - Lethe tool, 1 unlock tool ( cabin ), 1 unlock tool ( Bag ), for each reward. Give the Tavern Boss 100 Silver Coins. 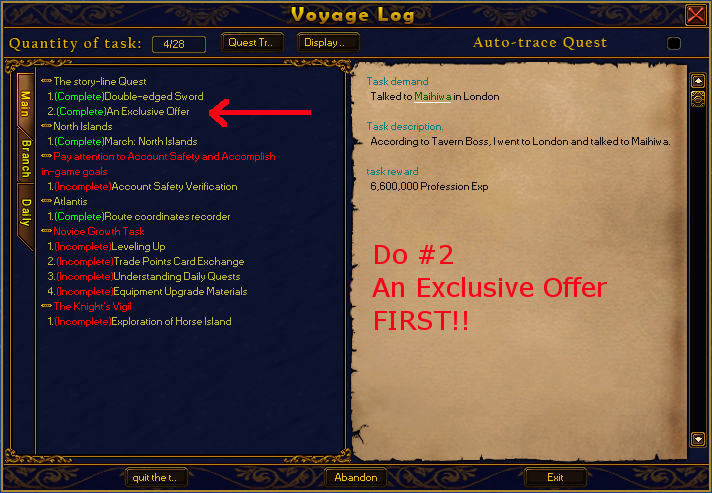 Note: opens 2 quests Double Edged Sword and An Exclusive Offer. Because of this, the quest numbers have been re-written (as of 9/7/16) to match the order you must do them in (and not necessarily the order they are in the voyage log). Talk to Maihiwa in London. click through all the screens that pop up then talk to him again. Give 1,500 Silver to Maihiwa. Talk to Aleger (NPC actual name is; Arrigo) in Tripoli. You do not HAVE TO do this quest. Leave it open if you want and clear it one day when you are near Tripoli. Go to Tripoli subs and collect 1 Jute and 1 Isatis root.and give them to Alegar (Arrigo). Words in task description say 10 but you only need 1. Use the big overhead map, a blue dot will appear when you get close to a plant. mouse over the blue dot on the map to see what it is. 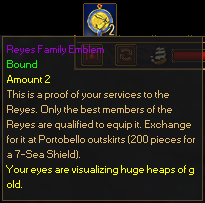 There is a note in Voyage Log Text of this quest that tells you "you can now get free gear from a Voyagers Times gear quest"
This is very old text, actual uniform and helmet tasks were removed from The Voyagers Times. "Gear" tasks are now trader tasks that do not open until level 120. Voyage Log auto track gets stuck at high sea and in town use regular auto track..
Talk to Andy in Hamburg. Voyage Log auto track gets stuck at high sea. Go to the Officer of the MA you chose. Note: Choosing an MA in this quest seems random, I just picked one, didn't even really look. You will choose Either Islandi or Nederlands Alliance... HOWEVER this is a text error, it is suppose to be IBERIAN (Lisbon) or Nederlands (Amsterdam)! *** New*** The Game now knows which you choose and will give you the correct auto-track link. * When I chose Nederlands Alliance and went to the MA officer in Amsterdam, there was no dialogue when I clicked him, the quest immediately advanced. * Voyage Log Auto track for "islandi merchant alliance" takes you to the Lisbon Iberian merchant alliance. *I am now 110 Profession/ Vocation level. Talk to the Docker in Las Palmas. Note: For this quest I simply waited about 10-30 seconds, in the High Sea just off of /next to Las Palmas and they attacked me, I didn't even go looking for them. They can not be boarded, so sink them on site. These special pirates have light blue sails (and only appear when on the high seas). If they take a while to show, just move a little bit, it seems to trigger what ever detects your presence. I did however have to go on land after each ship killed and repair my ship and shield and heal a few sailors.. (and myself because I was silly and forgot to repair my hull the first time so i died grr). if you pick up the "drop" you will get 5 slaves ( they show in your ship goods)... if you carry the slaves your ship will turn into a "slave ship".... this is part of an event that for some reason is not disabled!! However the NPC "slave trader IS disabled.. so go figure. Talk to the Dakar Docker. Buy 1 Trader good from trader, go to high seas off of Dakar, and destroy West Africa Pirate Ships , pick up any wreckage until you get the Eastern Chart. You DO NOT need to un-equip your sea mermaid! Right click the chart and choose to give to alliance to go onto to next mission. Note: Continue sinking the Pirates until one drops the chart in the ship wreckage. Right click the chart and choose to give to alliance to go onto to next mission. Have Autoloot on so you do not miss picking up the chart!!! Make sure you have open slots in your inventory BEFORE starting this quest! Chart goes into character Item slot. But have open slots in Equipment and Articles. I had no problems killing the ship using a level 10 raider (same as before). IF you have difficulties killing the ships by yourself: 1) have a friend help (but make sure you get the kill shot) 2) get some better sea battle jewlery 3) do the ability quests in sea battle and level your ship and cannon stunt higher. 4) use a refined Nav Star figurehead if you have access to one. You will probably need level 6 buckshot cannon to completes this quest semi easily. Did quest on 11/27/2011 got chart from 2nd ship... be sure to look where ship sinks! Did this quest 3/3/2012.... it literally took 15 or 18 kills before there was any wreckage/ chart to pick up. Did the quest 5/25/2012 got it off the first ship. Did the quest 8/28/2013 and got the chart off the first sunk ship. Did quest on 7/12/2016 got the chart off the first sunk ship. Did quest on 9/6/2018 got it off the first sunk ship. *dont forget to get rid of the trade goods you needed for this quest. Return the Eastern Chart to the MA officer you chose in #80. Use your log book and click the green underlined words to auto track to the MA officer. This will be the MA officer in Lisbon (Iberian) or Amsterdam (Nederlands)! At this point I hit profession level 120 (June 2017/ September2018). "Secure (Begin) an apprenticeship" quest will open; This is a separate quest line (called Knights Vigil) that opens at level 120, it is not part of the beginner quest line. You may also get messages in white (Public General Channel) that "preparation is key", is received and then completed... this is the next beginner quest line task you have yet to talk to the npc..
"Explore the new World" will also open at 120. This is the first quest in the North Islands Quest line - do not try to do this** until you have finished the 2nd Knights Vigil and have gotten the free lvl 140 uniform, helmet and weapon. ** You can do first 7 quests but after that they are up in/at North Island. "The Best Trader" a Voyagers Times Gear task will open and complete. And "Sell level 8 goods" (also Voyagers Times Gear Task) will show to be accepted. "Memories" a Master and Apprentice quest will complete (even if you did no extra training). You will also see "this quest can not be tracked" MANY times in white chat... this is likely the old removed Voyagers times quests and old removed beginner quest line quests. Also at 120 the Ctrl+W Logbook will open for you once every day, and give you a "time card" when you click the left bottom button. It will auto open as soon as you change scenes (if you are logged on when it resets) or will auto open when you log on. all the other "prizes" are for captains (guild leaders) or Fleet/Royal captains which we dont have Fleets anymore. the daily quests given by the "Daily Instance Quests Giver" in Athens (Dock) or Seville (Sanctum of memories) will start giving you 1 land and 1 sea quest per day. It will offer you 2 Land and 2 sea... the first one is the easier task... take the easier tasks! You will want to do the daily quests as much as possible , the instances give you refining items that you Need!! and when you turn in the quest you get even more stuff you need plus guild vigor if you are in a guild. Also do the daily trade quest. You will need the Trade Point Cards it gives for exchange of refining items and repair kits in Barcelona. The Valentines Day Envoy offers 2 quest "lines". Take the first one where you deliver a letter to Athens as often as you can it gives good experience points (but crappy rewards.. just toss them to the ground). you can get 10,000 Trade Point Cards (TPC) every day - and you need TPC to get refines to make your gear stronger. Was suggested to me by guild mate, now that you hit 120, stop this quest line for a short while...and do the 120 Knights Vigil Quest Line for the free 120 equipment. The Equipment will help you finish the rest of these tasks faster. At this point, I was able to do the 120-Knights vigil quest line all the way up to but not including the very last sea battle quest. I now have 120 Land Uniform and Jewelry and 120 Sea Jewels which makes the rest of this quest line incredibly easy (sea battle uniform no longer given ). Reward (Voyage Log): Prof Exp 3,700,000, 4 weapons Exp 600,000 and War Drummer. Reward (chat): Prof Exp 200,000,000, 4 weapons Exp 600,000 and War Drummer. Do not EVER throw away the War Drummer or you will not be able to finish this quest line. You need it to complete quest #112. Talk to Andy 3rd time. you do not need to do anything... just talk to him again. This is a bit confusing quest text says Andy will give you some materials... click to get them., but you do not get them this time..I guess he just wants to give some more Profession exp. Talk to Andy a 4th time. You may not be able to remove the figurehead from your ship with out first removing some cannon and some regular provisions or cannonballs - there may be too much weight. Go to the warehouse and open a warehouse (or use the bank) to put your items in there temporarily while you upgrade your figurehead. If you used the 3 x 9 stones on your figurehead you will notice you now can hold more cannon on your ship. If you have the coin, now is a good time to upgrade your cannon fight stunt to level 5 at the skill tutor just inside the city.. (that's the highest you can promote it at this point) so that you can use level 5 cannon. 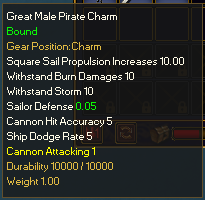 Once you promote your stunt level the cannon will be available for purchase at the ship yard boss. Now is also a good time if you have access to item mall (real money) to buy some "Enlarge Cabin" items so that you can hold all the drops of cannon and shields from the battlefield. You may want to stay a while and collect the level 5 cannon you need/ will need after you use all the 99 stones you are about to get. Destroy 10 North Sea Jackal Armed Ships and 10 North Sea Golden Eye Armed Ships then report back to Andy. *New* While i was in North Sea battlefield I got a card (random drop??) that gave me a quest to kill hurricane puppet pirates... might save that quest for later. You will receive 99 (total) of each type of stone to upgrade the Navigation Star Figurehead. 3/5/14 - The upgrade rate must have been changed. 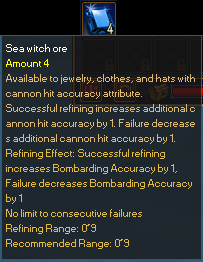 It use to be "easy to max your figurehead", now... so far I have used 40 wind carved stone and only gotten 2 successes. I will try my luck tomorrow.I had a much better success rate the next day... more lile 5 fails to 1 success.... however I still did not need all the stones. **Don't forget to buy more cannon at Shipyard Boss or get some from sea battlefields or friends before going into sea battle next in Faial. 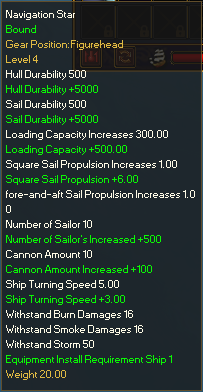 Don't spend it all on cannon because you will be forced to buy sailors before sailing as well! 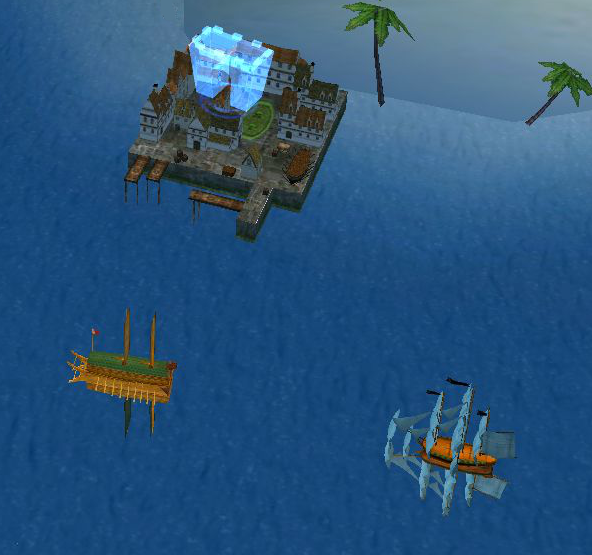 Suggestion; open/accept the Voyagers Times Reputation Fayard Pirate ship quest before sailing. Fayard = Faial and the kill for the Beginner quest will count for the Voyagers times. Go to Faial Island Offshore. Have shield equipped, cannon balls ready any certificates or signets equipped and any sea battle potions ready.... the next quest starts automatically when you enter the offshore. If you think you might die, sail to Lisbon or Madeira first so you will not have so far to sail back if you re-spawn.As I now have 120 sea battle jewels I had no problems and got the letter on the first kill. Though you may get mobbed by other type of pirates there are Falcon and Tiger Armed Ships as well as the Faial Island Pirate ships that you will need to kill. Kill Pirates on Faial offshore (Kill "Faial Island Pirate" ship) and sift through wreckage for "Pirates Letter"
Click the letter to read it to continue the quests and get the reward. I suggest you exit to the high seas then click the letter for the next quest. Note: You will need to continue sinking the Pirate Ships until one drops the letter. You use to have to kill a lot of ships to get the letter to drop but as of 3/15/2014, I got the letter on the first kill drop I picked up. Talk to Augur in Accra. you automatically "submit this quest and end up in the Congo Jungle for the next quest. Go into the tree/forest area. Kill 10 Gorillas, collect 5 internal organs, then talk to Matassar in Congo Jungle. Unfortunately because the internal organs are bound you still must click the pop up "yes" to collect every time you kill a gorilla. Go to Mozambique and talk to Wilfred. Go to Dakar and talk to the Dungeon Guards. **if you are on auto track the dungeon passport is taken out of your bag, you enter the dungeon, and this task is turned in automatically. Kill 10 Spanish Slave Traders and 10 Portugal Slave Traders. Report Back to Wilfred in Mozambique. As of 6/6/2017 Defense of Yizhou update; you will collect an item (when you kill the "traders" and other monsters in the dungeon) called "Sporadic Clue". Just throw these to the ground. You do not need these until you are a much much higher level and they are pretty easy to get. Task automatically turned in when you land in Madagascar. Pirate King is a NPC that does not attack. He stands in the back center room of the regular Madagascar caves (-7, -120). Talk to Wilfred in Mozambique. **Voyage log auto track to Wilfred does not work while in cave... and your ship stalls outside Mozambique. Talk to the Mozambique Tavern Boss. Talk to the Mozambique Docker. 106. Defeat pirates fleet in Mozambique. Go to Mozambique High Seas and destroy 1 Mozambique pirate ship. You do not have to remove your Sea Mermaid for these pirates to attack. Sink a Mogadishu Pirate ship on High Seas in front of Mogadishu. Sink an Aden Pirate ship on HS in front of Aden. 110. The Victory is Near. Task automatically completes when you enter Battlefield. Talk to Wilfred again, Give the Battle Drum to Wilfred. You will need to have the War Drummer in your inventory; in ships articles or on character either will be accpted. Click the Wilfred's Gift (chest) to get a Wilfred's Ring (keep the ring you need it later in the quest line). I thought this might be a good time to try the North Sea instance quest ... the last quest in the 120 Knights vigil..only a few more quests in this quest line are on the European side of the map. at this point I was level 126 and had a total skill of 480 or so. I had to raise my cannon skill to 5 and buy all new level 5 canon (Thunder Buckshots) ( I could not get through the instance with lvl 1 cannon)..and used about 30-40,000 Armor piercing cannon balls. I used a lvl 10 raider with out any ship auxiliaries, a level 8 shield form Hamburg, a maxed Navigation star figurehead (168 cannon). *Note that autofire does not work in the instance... this is a game setting..NOT a bug. My 1 time through took about 40-45 minutes and I got; 2x Rogue family emblem (ship article), Zeus's figurehead (ship article), Black account book (ship article), card Zeus' figurehead (bag item), card black account book (bag item). Most of these are storm voyage exploration items. You must complete this task to continue the quest line. ***Warning, there is no buttons to leave the instance. Leave by sailing all the way through, sailing back to the starting point (small bump of rock), or by leaving/quitting your team. Make sure you have a good amount of time before you start this task if you plan to actually do the instance.. I did the entire instance took about 40 min... but after doing the North sea instance this one is a cake walk. I have a level 10 raider with (168) level 5 cannon, a level 8 shield, just the sea battle jewelery from knights vigil and the sea charm from this quest line. Used about 30,000 Armor Piercing (cannon) ball, ship was hardly damaged, and only injured 3 sailors. *** At this point my Voyage was level 59 (but I had sailed a bit more than just the quests)... so I sailed some more in the Mediterranean, picked up drifters for provisions and sailed a few storms to get to voyage 60. Then went to Athens and took out my lvl 11 Ship from the knights vigil quest line. The lvl 11 (w/ fully maxed Navigation star figurehead) uses 36 more cannon but that was all I had to add. I did have "trouble" un-equipping my Navigation star figurehead as the load was too much. So I un-equipped the cannon, ram, grapple and then took out/ un docked the lvl 11 ship... then equipped them to the lvl 11 ship then took back out the lvl 10 and the load was low enough to unequip the figurehead... took out the lvl 11 again and equipped the figurehead. Voyage log is incorrect it is NOT the Genoa Docker, but if you auto track it takes you to your docker. Talk to Captious Refiner in Genoa port (again). However in regular server I used all 99 of both cannon stones never got above +7 and ended with +2 in both... so have; +2 Cannon Hit Accuracy, +10 Ship Dodge Rate, +2 Cannon Attacking..
but that's ok because the 120 rings from the Knights vigil are better anyway. The refining stones are bound so just drop the extras on the ground. Accept Maltese Skirmish from Maltese Defense Battle Envoy of Mobilization in Genoa. Talk to him and take the task for "Maltese Skirmish"
I missed writing down the exact words the NPC said but you just click through 2 screens and then the quest goes to #121. ie. you "get the form" and submit the task..
Make a team then, when you sail to Maltese Island, select; "take part in Maltese Skirmish"
instance takes a few minutes to start. Ships begin to spawn when Valeta's ship disappears. In test server, with a new character I was able to kill 1 ship and parts of s few others... if you are doing this w/ out having done knights vigil, I suggest you take auto fire off so you can continue to hit only one ship. But in regular server because I had done knights vigil and had sea jewels and lvl 11 ship with lvl 5 cannon, I was able to solo (teamed with npc) the entire instance. Note: This quest is really out of place. If you are new to the game, there is no way you are going to succeed alone in sinking Hassan. (this is why they changed it to just an automotive light boat). Talk to your MA officer. (see #54) *No Auto track in quest interface. Talk to the Bombay Tavern Boss. ** when auto track sailing to Bombay, for some reason you stop sailing just outside the city so you will have to click the "anchor" to enter Bombay. **when you find the treasure you will get some Rare Literature click it to get Profession exp. VERY IMPORTANT, there are several tasks that give maps or treasures. Most treasures in the Storyline are quest props. DO NOT authenticate the treasure, unless directed by the task, or you can not finish the quest. If you do authenticate, then you need to acquire the treasure again to complete the quest. If you need another treasure, either buy the treasure from players or find it using maps you put together yourself. Talk to the Suez Docker. *Auto track has you land in Suez but you have to turn around and click the docker to talk to him. Reward (Voyage Log): 19,000,000 Profession Exp, and Bible Treasure Map. Reward (chat): 70,000,000 Profession Exp, and Bible Treasure Map. VERY IMPORTANT, there are several tasks that give maps or treasures. DO NOT authenticate the treasure, unless directed by the task, or you can not finish the quest. If you do authenticate, then you need to acquire the treasure again to complete. Either buy the treasure of find it using your own maps. Most treasures in the Storyline are quest props. 2nd post in "Treasure Map, Treasure finding for beginners"
Talk to Bombay Tavern Boss. Talk to the Ceylon Docker (Sri Lanka). Ceylon = Sri Lanka remember this for future quests! Sri Lanka was known as Ceylon when it was a British Crown Colony. Ceylon = Sri Lanka remember this for future quests! Reward (Voyage Log): 20,000,000 Profession Exp and Korean Great Treasury Scriptures. Reward (chat): 70,000,000 Profession Exp and Korean Great Treasury Scriptures. Bring the treasure back to Akbar in Bombay. Destroy 3 Gulf of Aden Golden Armed Ships in Aden Battlefield and report back to Bombay Officer. Voyage Log Quest text is NOT CORRECT!! - Kill 3 Aden Golden Eye Armed Ships in Aden Battlefield! **You must have your Heirloom weapon on your character to receive the award and continue the quest line! 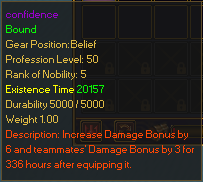 Reward (chat): 70,000,000 Profession Exp, and enhancement item for your weapon type. Enhancement items goes to Items tab on character and looks like the heirloom weapon. Use enhancement item on your heirloom weapon and it creates a level 51 weapon with better stats than the level 61 plain I had been using. However you do NOT HAVE TO use it to continue the quest line. Talk to the Bombay Docker. *Log book calls npc "Masqat Trader"
153. The Crowds are angry! Talk to Tavern Boss in Sri Lanka. Talk to Seville Tavern Boss. Talk to your MA officer.Auto track not working for this one...you have to get there the old fashioned way by clicking. 158. I Want the TRUTH! Talk to Muscat Tavern Boss. Talk to the Basra Tavern Boss. Talk to (Melakan) Malacca Docker. Talk to (Melaka) Malacca Tavern Boss. Talk to (Melakan) Malacca Docker again. The auto track green link in the Voyage Log does not work use regular auto track to Taiwan Island. 3rd post in "Treasure Map, Treasure finding for beginners"
Talk to Malacca Docker again. Voyage log auto track does not work on the Island Use regular autotrack when on high sea voyage log auto runs you into land again!.. Another wonderful misspelling... Tourane (or Turon) was the name of Da Nang Vietnam when under French Colonial rule. 168. Treasure or Buddha's Halo? ** The Green words Borobudar in the Suburbs of Semarang do not auto track you to the suburbs (its broken). Use the regular auto track feature. 169. A Dying Young Man. Talk to Wang Er' ge in Semarang City. The quest text asks for a "soul ball"... this is Saria. Just RUN past the Pirates... they will hurt a newbie character.. run to the temple in the center of the suburbs and go up the stairs all the way to the top. Golden Buddha spawns on the platform that you see from the top of the stairs. **Spawn time between Golden buddah's is about 15 seconds, however people still camp the spot but it spawns in a slightly different place each time, so is a lot easier to get than it use to be. And if you are a returning player, no the Buddah's do not look like buddah's anymore they look like the Golumns from Imperial Mausoleum now. I also suggest you kill 2 Golden Buddahs and get 2 saria 1 for the quest and a 2nd to authenticate the Borobudur compound. For some reason the bells dropped by the Buddah's do not authenticate any more. 3/23/14. Reward (Voyage Log): 80,000,000 Profession Exp and the other half of Linfeng's Treasure Map. Reward (chat): 70,000,000 Profession Exp and the other half of Linfeng's Treasure Map. 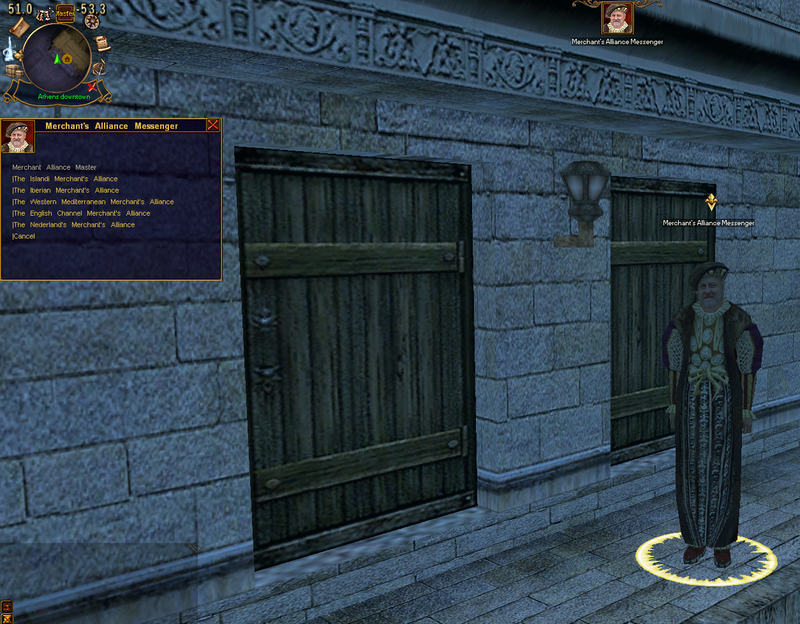 **again bad programming because your character interface is open to click the map and you can not read what is said. Talk to Xuan Zi (Sri Lanka) he takes the 2 halves and gives you back a full treasure map. Reward (Voyage Log): 50,000,000 Profession Exp and complete treasure map. Reward (chat): 70,000,000 Profession Exp and complete treasure map. Search for High Sea Treasure near the Philippine (Luzon) Islands. Still NO auto track for this one. 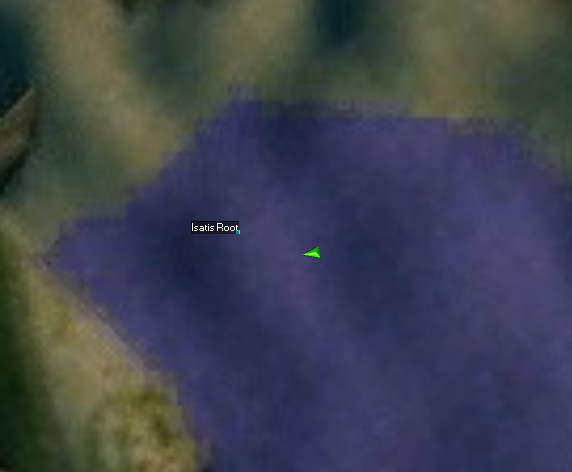 ( -1755, 184) that's where my treasure was found. Click link below to see pictures of map location and a better description to help you find the treasure. 4th post of "Treasure Map, Treasure finding for beginners"
Talk to Wang Er' ge in Semarang. Talk to Wang Er'ge again. Talk to Zhang Yuan Qi in Quanzhu. Even China Version Does not continue from this point, so do not expect it to ever be extended. all other skills are learned but only skill level 1. Skill levels at this point with minimal weapon leveling and some authenticating and not doing Knights Vigil Quest line.